The big buzz in the tech community now is Home Automation, and the Smart Home ecosystem of products is exploding with new devices every day that help to automate actions, provide greater access, and improve efficiency. A few years ago nobody could have predicted that millions of people would have Amazon and Google robots in their homes listening to conversations, but here we are. A slightly lesser-known but also rapidly developing segment is the connected car ecosystem, which aims to mimic some of the elements of the connected home, but in autos. That push takes a huge step forward with the Muse Auto, an Amazon Alexa voice assistant for vehicles. So what exactly is a connected car? Well that is actually a moving target, since the threshold for driver-facing technology in the car is lower than say it would be in your home. 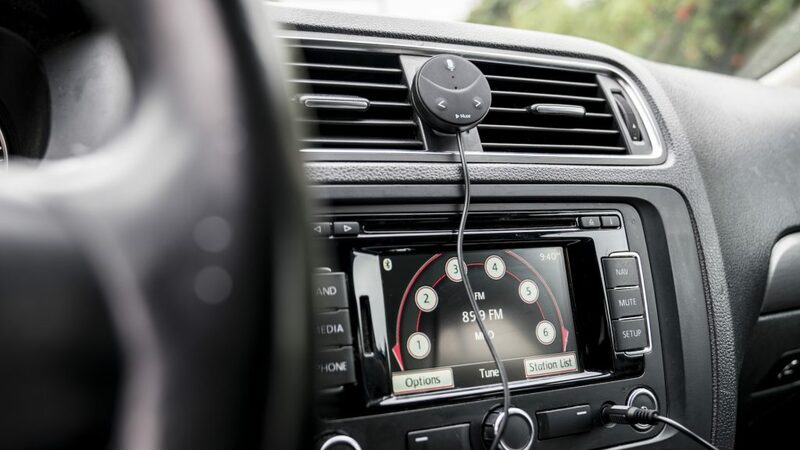 Basically, a connected car is a vehicle that has connectivity to the internet, or devices within it that connect to the internet and can operate beyond the confines of the vehicle. Often times, this takes shape in the form of utilizing the driver’s cell phone as the portal by which different in-car devices can communicate with those outside it, or even just devices in the vehicle communicating with a smartphone app. Some of the less successful connected car devices simply have an app that doesn’t serve much purpose in actual use, while the winners and blending ease of use with the necessary intuitive nature for use on the road. The Muse Auto finds itself among the latter. The Muse itself is quite a simple physical specamine, measuring only about two inches in diameter and using a soft-touch rubber to cover the three command buttons. There is a button to skip forward, one to skip backward, and one for mute, as well as a couple status RGB LEDs. 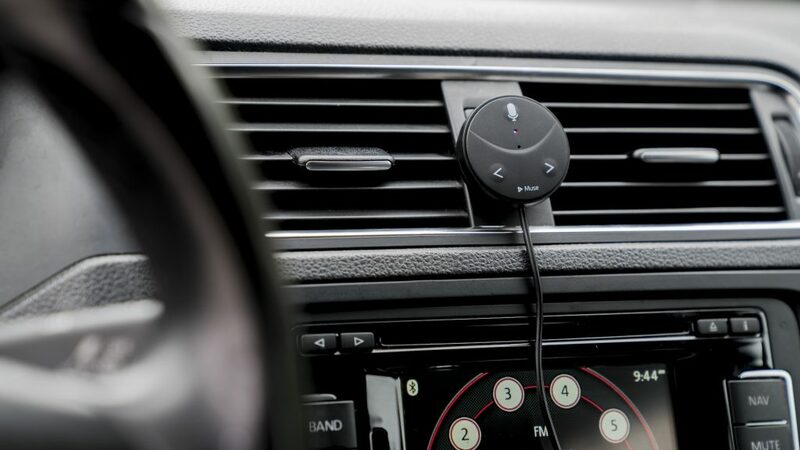 Since you should have the unit placed in a spot where it can hear vocal commands, the folks at Speak Music who developed the Muse Auto and launched an Indiegogo campaign added both a magnetic back and an adhesive backing onto the device. Connecting the Muse to the vehicle are two cables, one for power via the USB or 12V plug, while the other is a 3.5mm AUX plug. Muse Auto relies on the user to download the Amazon Alexa app and connect with the current account to get the full benefits, however those without an Echo product in use within the home can still set up an account to use the benefits of what Alexa can do. 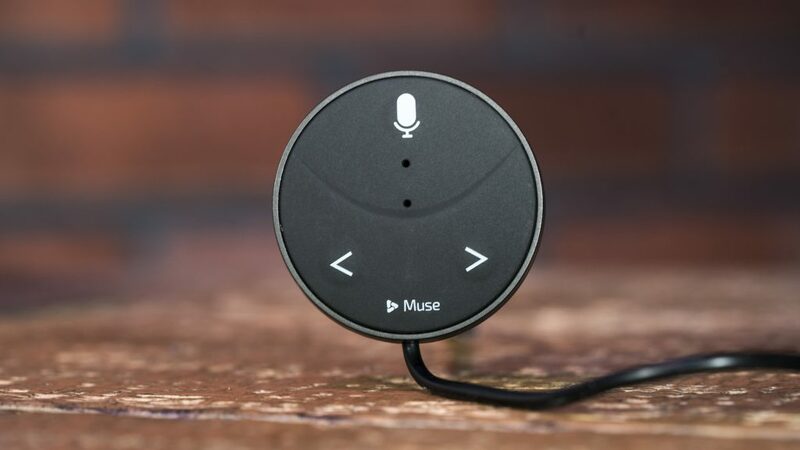 Essentially, the Muse Auto works exactly like an Echo would, where any Skills enabled in the app become available for voice command simply by saying “Alexa, …”. It uses the driver’s phone as a connection point to relay from the microphone to delivering the content, connected via Bluetooth. So all that is super cool and all, but what can it really do? 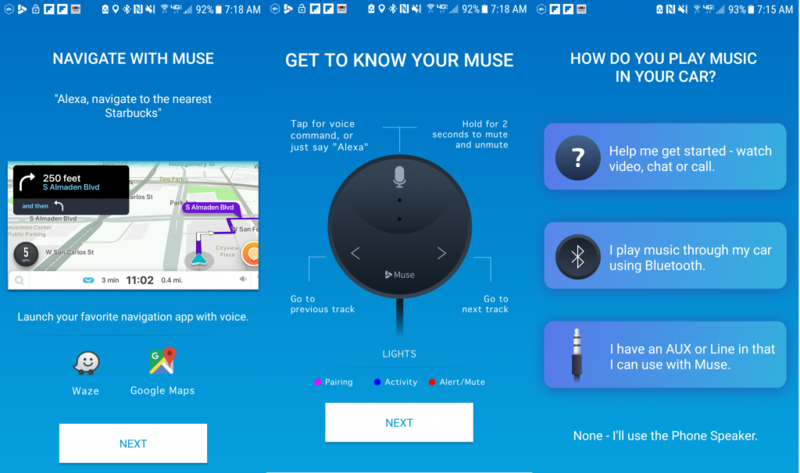 Well since the Muse is just like an Echo, drivers have access to over 30,000 different Skills available from everything like reading audio books to opening smart garages, playing music, making calls, and pairing with Waze or Google maps for voice-activated navigation. With that many different capabilities, you can pretty safely assume that there are more things you can do with the Muse than you will ever have time to do, but there are a few neat Skills that stand out with the implication of being in a connected car. Of course, having music, podcasts, and audiobooks available is great and all, but having them all easily accessible via voice helps to eliminate scrolling through the phone whilst driving, which is something most people are at least a little guilty of. Some of the more Smart Home-centric skills are those like Nest, WeMo, iHome, Wink, Philips Hue, and so many more, but the factor I geek out on is how fluid the integration is in normal driving behavior. Once the $69 Muse is plugged in and the Alexa app is paired, it is as simple as saying “Alexa…” followed by any prompt that you would do to enable voice control on the home base Echo. When cruising up to a smart garage door, it is super intuitive to just say something like “Alexa, open my garage door”, and bam there you go. Maybe you are on the way home and want to be sure the temperature in your house is comfortable, you can just ask Alexa and she will deliver for you. For those that haven’t used voice controllers before, the only caveat to this is that you need to remember all the commands, however this is relatively simple if you start with just a few Skills. Can a Connected Car be Secure? Inherently the question with any Smart Home (or connected car) tech these days is whether or not it can be secure, how private is it, and so forth. Having an Amazon Echo Dot at home, it does seem quite frequent when she will pop off with a random response to a question I had not asked, which always gives me the creeps. These glitches are common with the home-based units, however in my use with the Muse on the road Alexa never gave a false reading and awoke unexpectedly. Being that Amazon has to comb the ambient environment for the “Alexa” trigger word, big data is always a concern. Fortunately, the folks at Speak Music thought of this. 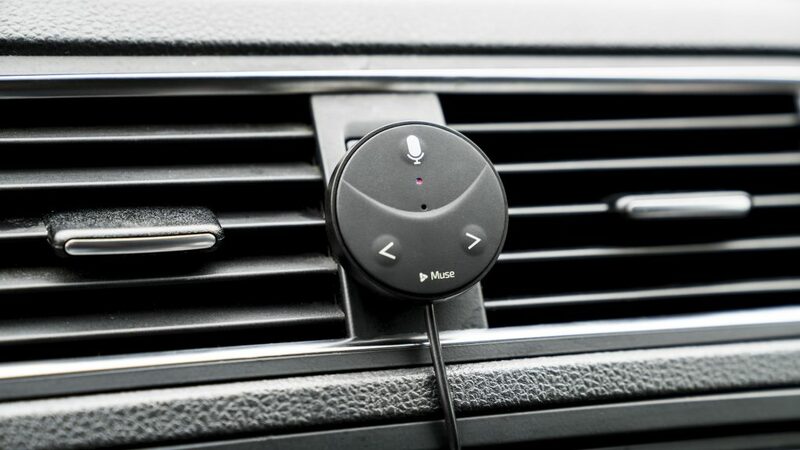 Just like on a normal Echo, the Muse Auto has a hardware mute button, which disables the microphone and allows drivers to have some privacy in their vehicle. There are a couple ways to go about building a connected car, one of which being to get a Wi-Fi hot spot on the car, while others are more focused on heads up displays that project data onto the windshield and use facial recognition. 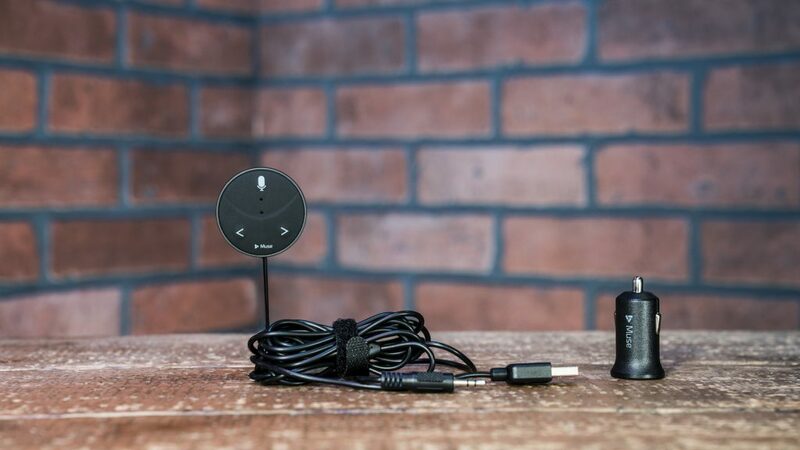 The simplest (and possible cheapest) way to build a connected car in my opinion would be to use the Muse to control garage doors, home lighting, thermostats, locks– anything that you can do with a normal Amazon Echo you can do with this nifty little gadget, from your vehicle. The only question is what else does the future hold for digital assistants? Smart devices are improving the way people stay connected and stay in control, but it doesn't stop at the Smart Home. 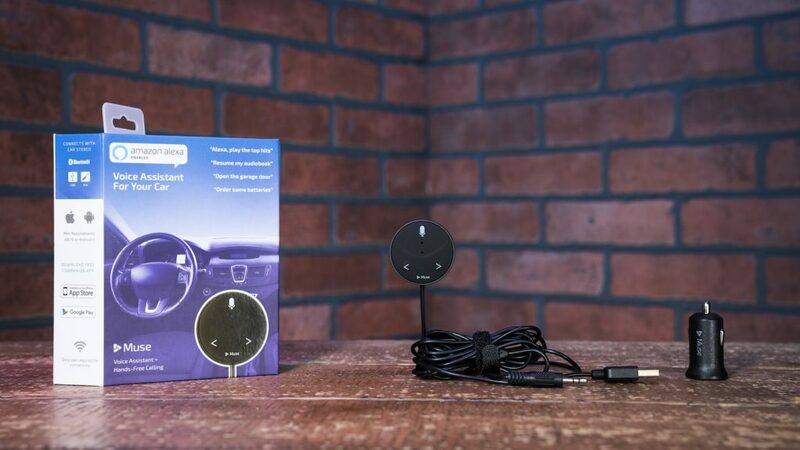 Muse Auto is a connected car device that brings the Amazon Alexa voice assistant wherever you go, with all her fun Skills. Next PostWhat’s New at Computex 2018?